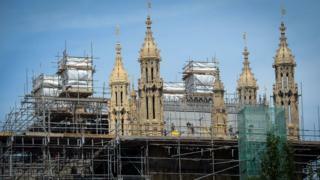 MPs will not decide how to repair the crumbling Houses of Parliament for another 18 months, the government says. Commons Leader Andrea Leadsom has proposed a new "delivery body" to assess the costs of the three options put forward to renovate the estate. Parts of the 150-year-old building, which contains asbestos and outdated cabling, are sinking. Ms Leadsom said successive governments had been "patching and mending" the Grade 1 listed building. "We do have to get going on this," she added. MPs will vote on establishing the delivery body by Christmas and it will take 18 months for it to report back, she told BBC Radio 4's The World at One. Parliament will then make a "final decision", she said. It marks the latest stage of the long-running debate about the repairs, which have been estimated to cost up to £5.7bn. A report in 2012 warned that "major, irreversible damage" may be done to the building unless significant restoration work is carried out. This was considered by MPs, who agreed to established a joint Commons and Lords committee to consider its findings. In September 2016, the joint committee reported back, recommending the "full decant" option - so the estate is fully vacated while repairs are carried out. But Ms Leadsom said there was a problem with this option - because the committee had not "bottomed out" its costs of this option. She also said it was "extremely important" to maintain a "Parliamentary foothold" for tourism and school visits. This could involve things like the state opening of Parliament and swearing in of MPs still taking place at Westminster during the repairs, she added.